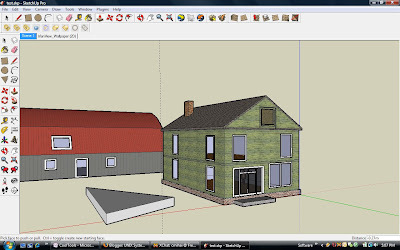 Google SketchUp is a simple, fast and easy to use CAD-like 3D software. It's what they use for the models in Google Earth, so it integrates quite nicely. And best of all, the free version rocks and runs both on Windows and MacOS X. The software is very good, and it can integrate seamlessly with Graphisoft Archicad and very simple to learn (partly due to the vast collection of video tutorials and available resources). SketchUp also comes with a Ruby framework for developing scripts, plugins and 3-rd party extensions. Once such extension exports scenes to be rendered to VRay. There is also a Maxwell Render plugin.